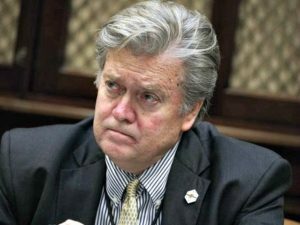 One of US President Donald Trump’s former close advisors, Steve Bannon Monday underlined that the five month-old diplomatic crisis shaking the Gulf region was provoked by President Trump’s visit to the region in May, adding that the political shake-up in Saudi Arabia is also consequence of Trump’s international maiden tour. Saudi Arabia, United Arab Emirates (UAE), Bahrain plus Egypt on June 5 severed ties with Qatar on grounds that Doha sponsors terrorism. Qatar has denied the charges. The crisis erupted few days after President met with Arab leaders in Riyadh in a major conference to mark a revival of strong ties between the Arab world and Washington. “I don’t think it’s just by happenstance that two weeks after that summit, you saw the blockade by the United Arab Emirates and Bahrain, Egypt and the kingdom of Saudi Arabia on Qatar,” Bannon said. The former US official noted that President Trump wanted to set records straight with Qatar for its binary stance. “You can’t have it both ways. You can’t on one side say you’re a friend and an ally and on the other side be financing the Muslim Brotherhood or Hamas,” he said. The US has blacklisted the Gaza-based Islamist movement as a terrorist group and the Egyptian Muslim Brotherhood might also fall within that category according to media reports close to US conservative politicians. Bannon also stressed that Trump’s visit triggered crackdown on critical voices and favored Saudi Crown Prince Mohamed bin Salman’s steady ascendance to the throne after leapfrogging and crushing his uncle, Mohammed bin Nayef in June. “Two weeks ago or three weeks ago there were a thousand clerics that were rounded up or somehow put under house arrest,” he said. President Trump swiftly at the onset of the Gulf crisis took the Saudi side before backtracking to propose Washington’s mediation to solve the crisis. Secretary of State Rex Tillerson has toured the region several times to find a common ground but he Sunday in Doha said that the Saudi-led side is not willing to engage in any talks with Qatar. Posted by KanelkaTagba on Oct 24 2017. Filed under Gulf News, Headlines. You can follow any responses to this entry through the RSS 2.0. Both comments and pings are currently closed.